Ireland will head to the Millennium Stadium to face Wales next weekend with their hopes of a Grand Slam alive and well. Declan Kidney's men defeated a dogged Scotland side 22-15 at Murrayfield thanks to a try from replacement No.8 Jamie Heaslip and 17 points from the boot of fly-half Ronan O'Gara. A stunning effort at the start of the second-half allowed Ireland to claw back a half-time deficit for the first time in nine years, clinching the penultimate victory in what they will now hope to be a triumphant clean sweep. Ireland coach Kidney made his first changes of the Championship following his side's scrappy win over England, restoring Denis Leamy and Rory Best to the pack and experienced campaigners Peter Stringer and Gordon D'Arcy to the back-line. Frank Hadden also made significant changes to his Scotland side, calling Chris Paterson in at fullback and giant lock Jim Hamilton back into the second-row after injury. Scotland's wide men immediately made an impression on the game, with Simon Danielli breaking clear after some strong play from skipper and scrum-half Mike Blair. Danielli, who bagged a brace against Italy two weeks ago, was hauled into touch short of the line but Ireland had been fired an early warning from one of Scotland's form players. Paterson showed his worth to Scotland after only five minutes, stroking over a penalty to confirm their early ascendancy. 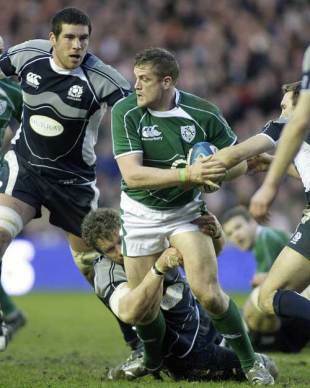 Ireland's abrasive back-row slowly grew into the game, hassling Scotland when they were in possession and drawing a penalty in the Scottish 22, which Ronan O'Gara confidently slotted. Parity on the scoreboard was short-lived for Ireland however; as the metronomic Paterson scored another penalty after Denis Leamy refused to release a tackled player. The early exchanges of the game were dominated by the respective back-rows, and following a huge effort from the Scottish scrum it was Simon Taylor and Alasdair Strokosch who produced the next scoring opportunity. Carrying with pace and purpose the duo punched a hole in the Irish defence before Ireland skipper Brian O'Driscoll was pinged for kicking the ball out of a ruck. Paterson once again made no mistake with his kick. Ireland secured field position after Scotland were penalised at a scrum on their own 22, and following some verbals from former skipper Jason White referee Jonathan Kaplan marched Scotland back 10 metres. Ireland soon had further advantage after the Scottish defence strayed offside at a ruck, O'Gara drawing them back to within a score from in front of the posts. Scotland's attacking endeavour continued however, with Paterson making a sniping break after strong work from Max Evans and Graeme Morrison in midfield. When the ball was lost it fell to Ireland fullback Rob Kearney, outstanding so far this tournament, to clear his lines. Leamy's involvement was ended after half an hour, the Munster back-row's injury nightmare continuing thanks to the brutal exchanges in the contact area, the in-form Jamie Heaslip was his replacement. The scrum continued to be an area of contention as the half wore on, with Kaplan penalising veteran Ireland prop John Hayes on his 10m line. Paterson extended Scotland's lead to six, but his side was immediately pegged back by another successful attempt from O'Gara following a mistake at the restart by White and openside John Barclay. The Murrayfield faithful found their voices as half-time approached, their roar accompanying Scotland's march to the Irish line following a charge-down from an O'Gara clearance. Ireland's back row was as committed as ever, and Evans held on to the ball short of the line, conceding a penalty to relieve the pressure. The Evans boys weren't finished for the half however, with Thom racing on to a chip over the Irish defence, his searing pace setting up Godman only for the Scottish fly-half to knock on in contact after a fine cover tackle from O'Driscoll. Ireland hit the ground running in the second period, their handling appeared crisper, and their angles more precise. Scotland weathered some pacy early attacks before Paterson nearly pounced on a loose ball. As the Scotland fullback hared away to the sticks, Tommy Bowe emerged with the ball in midfield to save a certain score. Despite this interlude, Ireland were increasingly taking a stranglehold on the game. Scotland were surviving on limited possession and following yet another secure lineout from Ireland their resistance was broken. Scrum-half Stringer scythed through the defence, standing up the remaining defenders before feeding Heaslip to score. O'Gara slotted the conversion as worryingly for Scotland Mike Blair hobbled from the field. A superb touch-finder from Paterson sent Scotland into Irish territory soon after, and replacement lock Nathan Hines cranked up the pressure by charging down a clearance from Stringer. Ireland's lineout was functioning beautifully however, Paul O'Connell dominating the set piece. O'Gara stretched Ireland's lead to seven points with a sweetly struck drop-goal just before the hour mark, and Ireland's combination of pace and power was beginning to tell against a tiring Scotland defence. As ever Paterson was able to slow the Irish charge, knocking over his fifth penalty before O'Gara missed a chance to cancel it out with a penalty of his own minutes later. Ireland took their foot off the pedal as the half wore on, their early momentum dissipating as mistakes began to creep in to their game. Disaster nearly struck for the home side when fly-half Phil Godman found himself under pressure from two Irish defenders metres from his line. After attempting to dance his way clear Irish centre Luke Fitzgerald pounced before the ball rolled into touch. Ireland won a penalty from the ensuing lineout, allowing O'Gara to extend their lead back to seven points as the clock hit 70 minutes. Scotland attempted to chase the game, but their handling let them down at several key moments. Ireland poured forward following a loose pass from Paterson, openside David Wallace charging down a clearance from Godman. From the five-metre scrum Scotland won a penalty, Paterson eventually clearing their lines at the second attempt following a missed touch from Godman. Ireland secured possession and waited out the final exchanges of the game, their 20 minute burst at the start of the second half setting up their tilt at a long-awaited Grand Slam in Cardiff. Scotland: Paterson, Danielli, M. Evans, Morrison, T. Evans, Godman, Blair, Dickinson, Ford, Murray, White, Hamilton, Strokosch, Barclay, Taylor. Replacements: De Luca for Morrison (70), Cusiter for Blair (51), Hall for Ford (57), Hines for White (50), Gray for Barclay (67). Not Used: Low, Southwell. Ireland: Kearney, Bowe, B. O'Driscoll, D'Arcy, Fitzgerald, O'Gara, Stringer, Horan, Best, Hayes, O'Callaghan, O'Connell, Ferris, D. Wallace, Leamy. Replacements: Murphy for Kearney (75), O'Leary for Stringer (65), Flannery for Best (61), Heaslip for Leamy (30). Not Used: Court, M. O'Driscoll, P. Wallace.